Each WEDGE comes uncompressed and in prime condition! The Wedges in the photo will be exactly what you get. Great for spot treating walls in your studio or office - For use in recording studios, control rooms, Offices home studios, home entertainment theaters, Home Offices 6 Pack covers 6 square feet - Each tile is 1 square foot of 1 inch thick acoustic wedge For professional acoustic control - Reduce waves, reverb and flutter echoes in smaller to medium sized rooms. MADE IN USA - Fire Retardant This product comes in 6 tiles that are 1 inch in thick with a height and lenght of 1 foot covering an area of 1 square foot each tile. 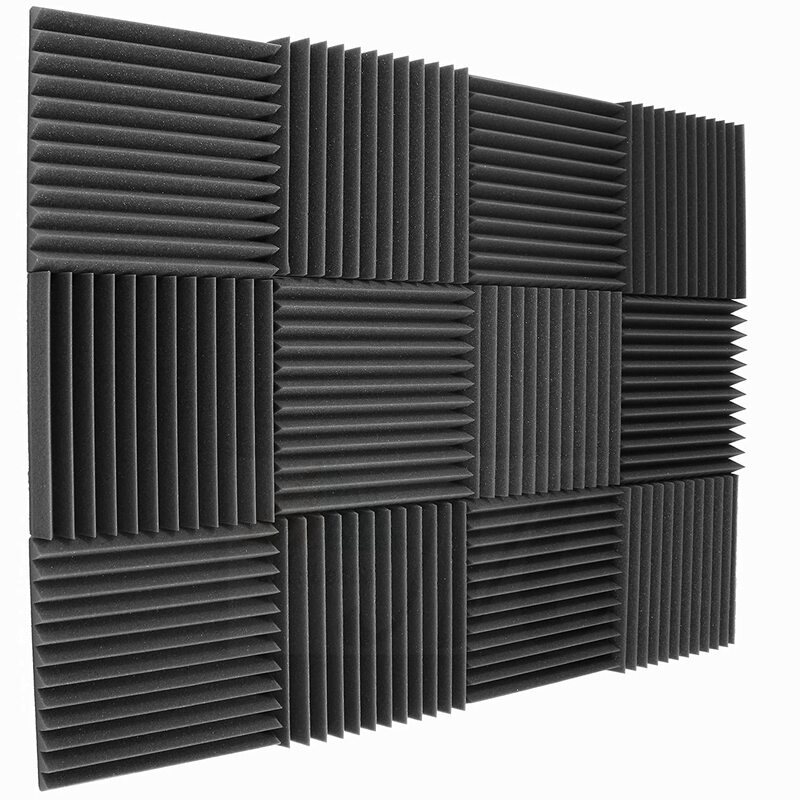 The depth of this foam at 1 inch provides better soundproofing over large areas. Thin foam, over a large area, has less of a chance of distorted and muffling the sounds reverberation. The uniform wedge design help trap airborne noise while alleviating flutter echo and slap back. This foam is ideal for spot-treating production studios, practice rooms or home entertainment centers. Also, this foam helps with smaller agitation echo complications. It is tested to effectively eliminate sound waves and flutter. Purchasing your own foam is the best way to tune your area without hiring a professional acoustician. This Foam will not deteriorate or fall apart over time. All that is required is dusting over long periods of time. Mybecca 12 Pack Acoustic Foam Panels Quad 2 inch Wedge Studio Wall Tile 2" X 12" X 12"
12 Pack Acoustic Eggcrate Studio Panels Soundproofing Wall Tiles 1.5" X 12" X 12"
12 Pack Acoustic Foam Wedge Panels Studio Soundproofing Wall Tiles 1" X 12" X 12"